Japan’s earthquake and tsunami have triggered meltdowns at several nuclear reactors, increased radiation levels, evacuations of hundreds of thousands of people in the face of radiation exposures already being reported. On Saturday, May 12, an explosion occurred from the buildup of hydrogen in the disabled cooling system of one of the reactors at Fukushima No. 1 (Daiichi) nuclear power plant about 150 miles north of Tokyo. The explosion damaged the building that houses the reactor and its cooling system. However, the reactor containment vessel, which houses the radioactive fuel rods, remained intact according to officials from the International Atomic Energy Agency, the UN’s nuclear monitor. Unfortunately, officials now report a partial meltdown at Unit 1. And Japanese media outlets are now reporting a second meltdown is underway at Unit No. 3. Hospital patients who might have been exposed to radiation were carried into a radiation treatment center in Nihonmatsu, Fukushima Prefecture, on Sunday. As of Sunday afternoon, 170,000 people have been evacuated from the area. Nearby residents have been exposed to radiation, however. First reports listed only nine people as testing positive for radiation exposure. 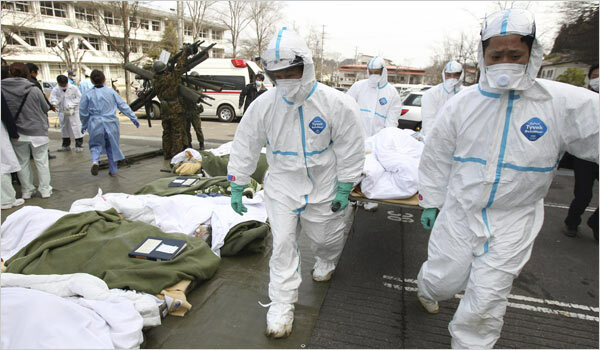 Japan’s Nuclear and Industrial Safety Agency (NISA) estimated that as many as 160 people may have been exposed. Meanwhile, unit 2 of the Tokai nuclear complex, near Kyodo and 75 miles north of Tokyo, is reporting a cooling pump failure. As well, NISA has declared a state of emergency at the Onagawa nuclear plant in northeastern Japan because of high radiation levels. Officials are claiming the situation is under control. See the piece by Robert Alvarez in The Huffington Post for details about the dangers from these developing situations. As a comparison, the accident at Chernobyl nuclear plant is instructive. Consider the difference, however, that this plant’s neutron cooling moderator was graphite, while the Japanese reactors are cooled with water, which does not hold and carry the radioactivity in its steam. Even so, the radioactive releases in the Chernobyl accident affected the entire northern hemisphere, as a book published last year by the New York Academy of Sciences documents. And Chernobyl: Consequences of the Catastrophe for People and the Environment, authored by Dr. Alexey Yablokov, Dr. Vassily Nesterenko and Dr. Alexey Nesterenko, finds that medical records between 1986, the year of the accident, and 2004 reflect 985,000 deaths as a result of the radioactivity released. For those who dispute those figures, pelase refer to the following link for details. Most of the deaths were in Russia, Belarus and Ukraine, but others were spread through the many other countries the radiation from Chernobyl struck. Building nuclear power plants on land subject to massive seismic events and tsunami aftereffects is highly speculative. Nuclear power is highly dangerous anywhere. So dangerous, in fact, there is no insurance company willing to back up their claims of safety. By the federal Price-Anderson Act of 1957, the owners of potentially destroyed reactors would be covered by private insurance up to $11 billion, a fraction of the trillions such a failure might cost. Hence, the bill would fall to the federal government and you and I. All US homeowners insurance policies exempt insurers from a reactor disaster. The most recent move by President Obama seeking tens of billions of dollars of federal insurance for construction of new nuclear power plants should be immediately shelved. As well, plants at Diablo Canyon and San Onofre are also highly susceptible to earthquakes and tsunamis amid a whole host of pressing problems. They should be shuttered at our first opportunity. Wind, solar, geothermal energy would not cause such dire threats to life in their environs. Thanks, Jack, for building on the common knowledge of the Japanese tragedy and highlighting some behind-the-scenes points here. The insurance issue you dug up is telling, for one. It seems unimaginable that politics could still trump what our senses are horribly realizing about what is unfolding. We’ve been subject to the institutions of “power” instead of what is real and sustainable. To me, the tragegy is screaming the demise of misguided “power” is real, literally, and….”come on people, don’t you get it NOW?” Can a wave of outspoken people turn the political tide and help see us into the establishment of wind, solar, geothermal energy sources? I would hope this too would be inevitable. You rallying points are helpful.